Tompkins County is named for Daniel D. Tompkins (1774-1825) who was born in Westchester County and practiced law in New York City. He was appointed an associate justice of the State Supreme Court in 1804. Three years later he was elected governor of the State. In 1816 he was elected vice president of the United States on the ticket with James Monroe and served in that capacity from 1817 to 1825. Tompkins County is located in the southeastern portion of the Finger Lakes and has a population of roughly 100,000. Its county seat--Ithaca--is situated picturesquely at the southern end of Cayuga Lake, the longest and largest of the Finger Lakes. The county terrain is an excellent example of the past work of the glaciers, which carved out many valleys through which run creeks over hundreds of waterfalls, large and small. The glaciers left rounded hills ideal for hiking through approximately 35,000 acres of public land. There are three institutions of higher learning in the county--Cornell University, Ithaca College, and Tompkins Cortland Community College. In many respects, education dictates life in the county. Overall, education--public and private--is the county's major industry with Cornell--the county's major employer--employing roughly one-fifth of the county's workforce. Nearly 40% of the county's businesses fall into the service sector. Non-education-based industry in the county tends to be of the high-tech variety. Tompkins County is basically a rural county that is blessed by the many advantages that come with being the home of a major ivy league university. Overall the population is quite diverse with many ethnic groups represented, well educated, open and outspoken in its views. Because of this, the residents tend to be talented, providing many opportunities to enjoy a wide variety of arts (dance, music, fine arts, and crafts), skills (construction, computer technology, and communications), and alternative lifestyles (farms and communes). The county has a number of museums and many festivals and other interesting events each year. 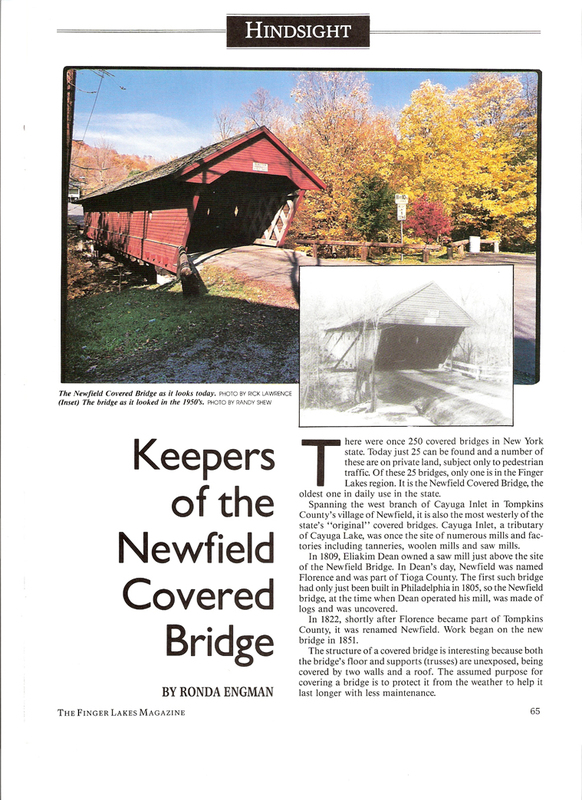 Although most of the places to visit and events take place in the City of Ithaca, one should not overlook the surrounding towns in the county (see below) that offer opportunities to look for antiques, purchase maple sugar products, pick fruit in season, kayak and canoe, and view one of the few remaining historic covered bridges in the state. Because the county surrounds the southern part of Cayuga Lake and because the county contains a considerable amount of open space, the county provides numerous opportunities to enjoy the outdoors. Boating, biking, hiking, golf, cross-county skiing, and nature appreciation are just some of the many activities available in the county. In addition, there are many wineries and breweries either in the county or nearby. 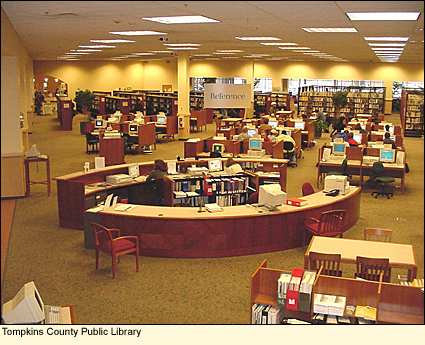 The Tompkins County Public Library has a large collection of books, magazines, newspapers, audio books, and DVDs. Its large and up-to-date reference section and considerable collection of local history materials is invaluable to anyone doing genealogical research. Internet access is free to all. Although the residents like to think of the county as "centrally isolated" because no interstate highways come into the county, Tompkins County is about an hour's drive from Syracuse and a two hours' drive from Rochester, the two largest cities in the Finger Lakes. Via Interstate Route 81, one can access Toronto, Philadelphia, and New York City. The regional airport connects with other airports on the east coast. Note: The Ithaca-Tompkins County Transportation Council has produced a teriffic map, indicating the most popular bicycling routes in the county. This is a huge map that can be seen and downloaded here. Copies of this map can be obtained for free from the convention and visitors bureau listed above. For restaurant ratings and reservations see: Open Table This list doesn't not include franchises. The is no commuter train or metro service to or within Tompkins County. Bus service within the county is provided by Tompkins Consolidated Area Transit (TCAT). Bus service on the Cornell University campus is provided by the university.